Map Scripting is a place to learn about the geolocative web. Get the basics of map APIs, mashups and current examples of maps on the web. 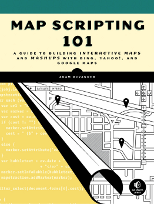 Map Scripting is also a book, or at least it will be. I’m busy writing it for No Starch Press. Occasionally I’ll post some book updates about my progress. I’m Adam DuVander and I help people create on the web. Most recently I wrote for Wired and Webmonkey. Previously I dug deep into location data and found people their best place to live.